Charge is a 1 Mana Cost Free Warrior Spell card from the Basic set! 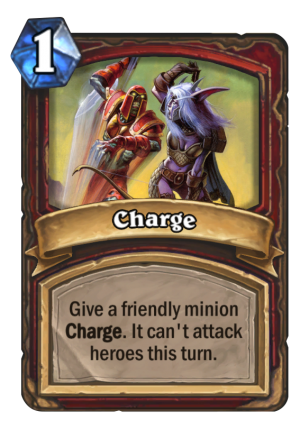 Charge’s Mana cost was reduced from 3 to 1 and the text was changed from “Give a friendly minion +2 Attack and Charge.” to “Give a friendly minion Charge. It can’t attack heroes this turn.” in the Hearthstone 6.1.3 Patch.